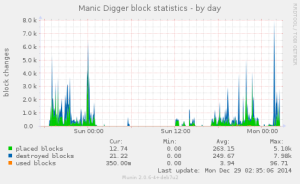 Hosting multiple Manic Digger servers it always was of interest for me how many players visited those. And indeed, after some work I can now present the Manic Digger Munin Plugin, displaying your server statistics as some nice little graphs! 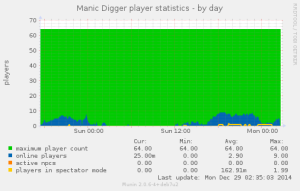 If you need further help regarding this Mod, feel free to post in the comments or drop a message on the Manic Digger forum post.